Feeling unfulfilled and lost in life can be a depressive feeling which can lead to resentment and frustration towards others and the world around you. Many people suffer from this and they often just can’t seem to snap out of it. They’re churning their wheels thinking that something someday will change for the better. The unfortunate truth is that they don’t know how to make that change but are hoping change will happen. This type of attitude leads to even more frustration and before you know it, you can end up feeling like you’re stuck in the bottom of a pit without a shovel to dig yourself out. There’s nothing worse than just living for the sake of it. On the bright side, we are fully capable of making a positive change to improve our lives. But we don’t really know how to go about doing it. You can be certain that without effort on your end, nothing will change. You have to ask yourself; what is your true calling? What is your purpose in this life? We may never know what it is but what we do know is what we don’t want in life and that’s the feeling of being stuck and feeling depressed and angry. In this guide, you will discover how to make a move towards living a more fulfilling life. You’ll learn how to find your passion, how to set goals, how to strengthen your mindset and visualize what you want, how to get rid of negativity and much more. Change happens when you decide to make it happen. Nothing is possible until you yourself make that decision and then do something about it. This is a very powerful guide that can help you find your true purpose in life and help you discover what you’re most passionate about. 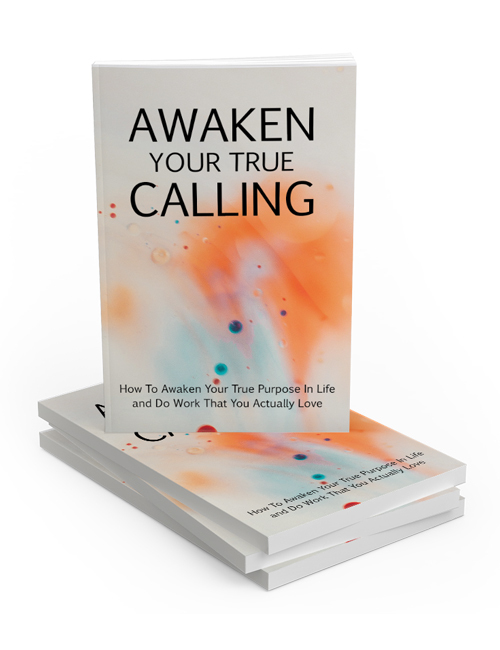 You can also get the Awaken Your True Calling video course if you prefer visual learning. A great way to digest the content so you can get yourself moving along faster in your effort to live a far better and more fulfilling life. Grab this course now.